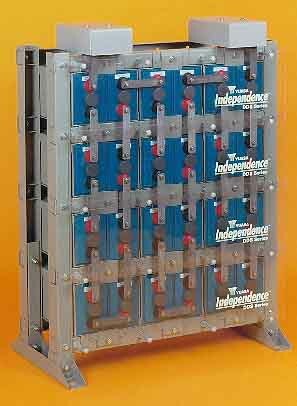 N/Ane 4-certified rack is for Independence DDS VRLA batteries, which deliver high power density of up to 8,000 Ah. The rack makes the batteries ideal for wireless, microwave, central office and other telecommunications applications that require high performance and Zone 4 certification. The rack is certified to 1997 UBC Zone 4, in any configuration up to 4 cells wide by 6 cells high or vice versa (48V units). Its pieces fit together in pre-drilled and pre-punched holes in many configurations. Cells are encased in dedicated protective steel cases that maintain a constant, uniform compression for the life of the cell. The batteries are available in standard voltages of 24V, 48V, or in customized voltages to meet specific needs. They are completely front-accessible, are available in 29 different sizes and non-standard configurations, have a recombination of >95%, and require no watering, periodic equalization, special ventilation or spill-containment systems. PO Box 14145, Reading, PA 19612-415. Tel: 800-538-3627; Fax: 610-372-8613.